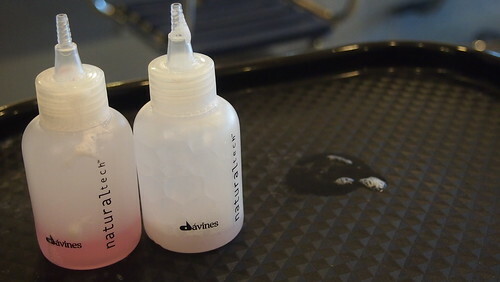 Ombré (as defined by Your Dictionary) is shaded or graduated in tone: said of a color. Celebrities have been sporting the Ombré hair, Kate Beckinsale, Lily Aldridge and now me. Charaught! 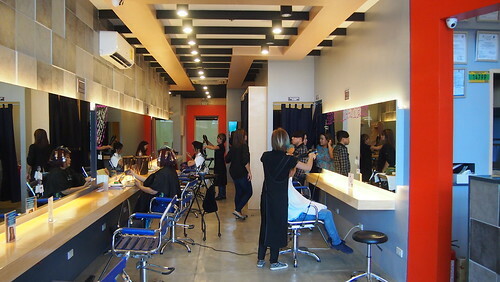 I've been wanting to change my hair color and finally had a chance when Meg invited us for a day of beauty at Azta Urban Salon in SM Jazz. 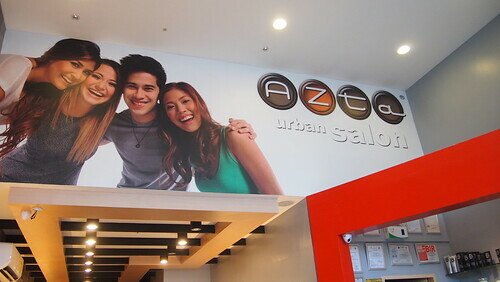 A friend of mine has been a loyal client of Azta Urban Salon so I know I will be in good hands. It was a Wednesday but a busy one for sure! 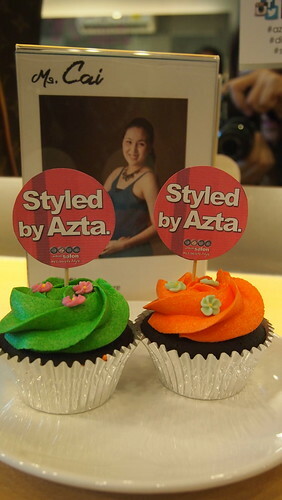 Styled By Azta cupcakes for merienda! 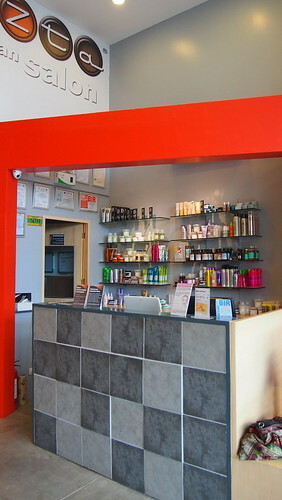 In any salon, the first step is have your hair shampooed. 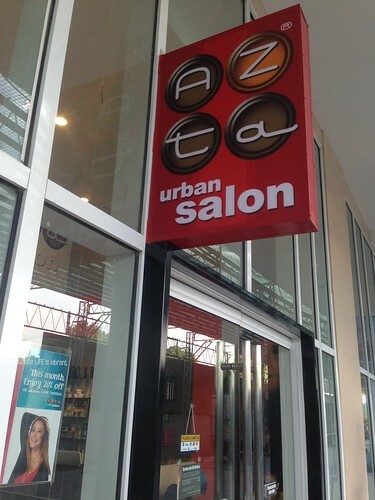 It's also the same in Azta Urban Salon except they use dry shampoo. It was my first time to use a dry shampoo and it's like a normal shampoo except they don't wet your hair. Cool beans! 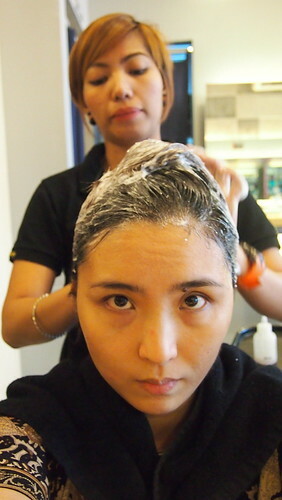 Then dried my hair before starting they start doing their magic! 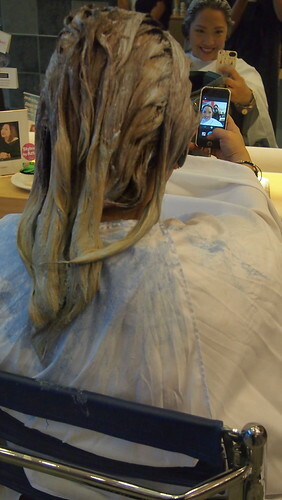 My stylist, Cris, asked me if I have a peg for what I want for my hair and showed them a photo from my phone. 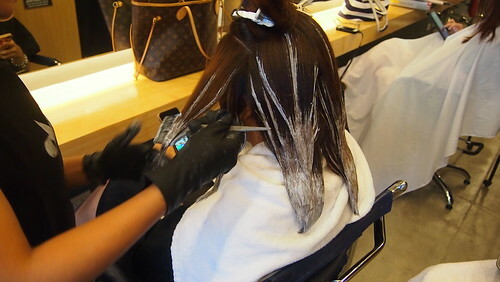 This is called balayage. 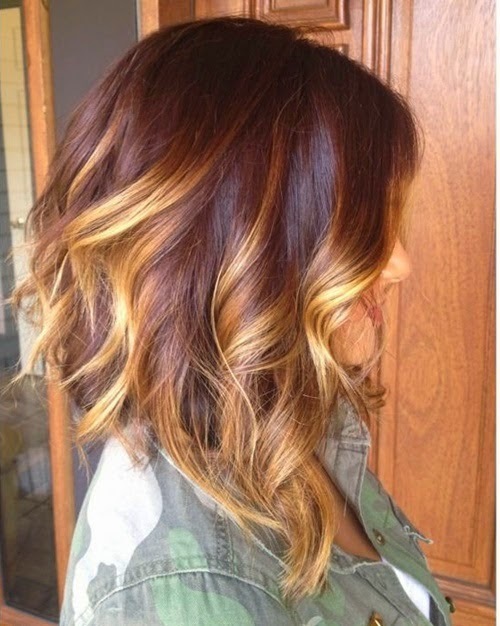 According to Google, balayage is a technique for highlighting the hair in which the dye is painted on in such a way as to create a graduated, natural-looking effect. 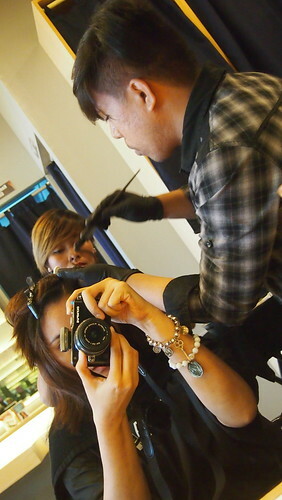 It looks like they are painting my hair. 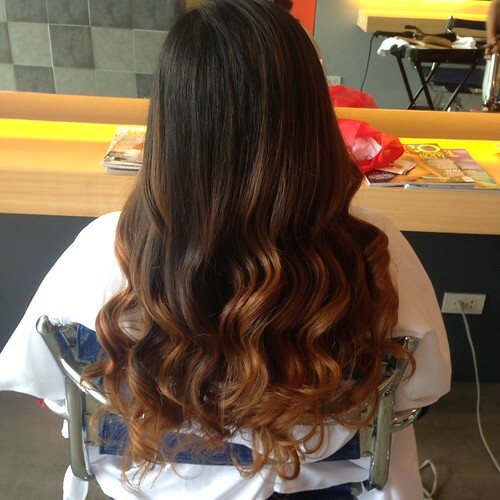 Ombre is an art! My glam team. Charot! Azta Team hard at work. Here's a video I took while they were doing my hair. 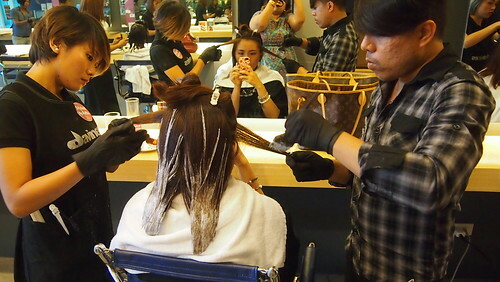 The treatment took about 3-4 hours and that's why I was glad Eli, Neva and Noemi were also there to have their hair colored! It's nice to have a chika-mate when you have to sit down for a few hours. 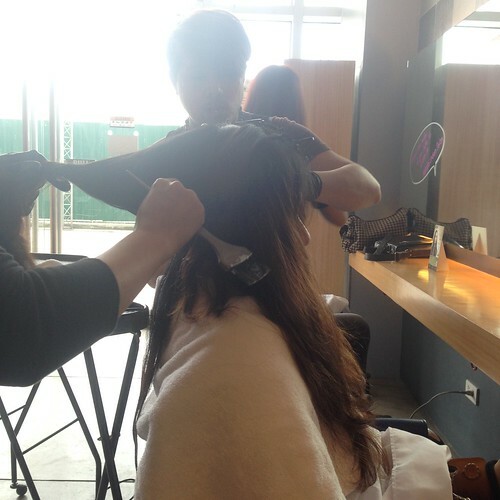 Noemi done with her hair color while Eli taking a selfie hihi! And after 3 hours and 2 cupcakes later, they rinsed off my hair and curled it. And I love how it turned out! I'm no Kate Beckinsale or Lily Aldridge but I love my Ombre hair! 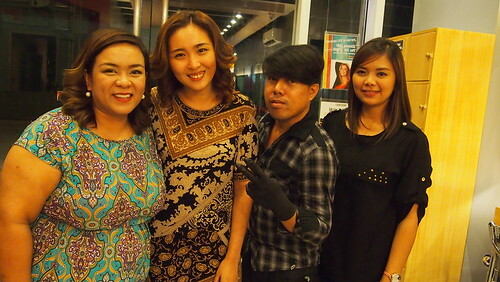 Thank you Meg for having me and Cris for taking care of my hair! And as a treat, Meg gave me a GC for Ombre Services which I gave to my friend Anne of Ant's Pocket. 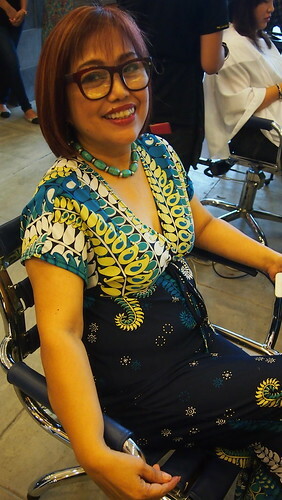 She's a hardworking mom who's always busy sewing for her business, that's why she deserved this makeover. Please do check Ant's Pocket, they make handmade felt plush dolls and more! Cris was also Anne's stylist and I was so happy how her hair turned out! 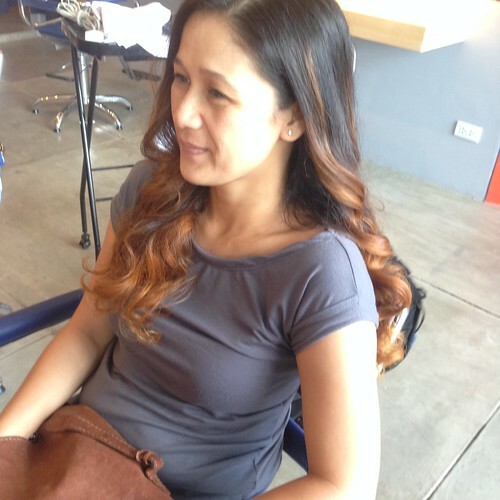 If you're looking to changing your hair, want something new, or feeling adventurous, why not go for an ombre style session at Azta Urban Salon, SM Jazz! Hello! 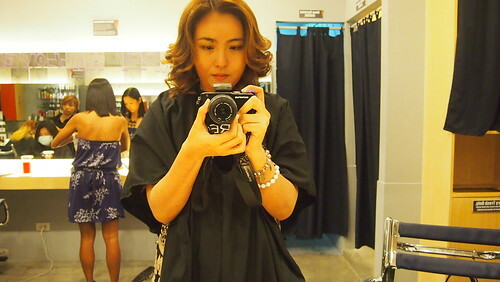 I love how your hair looks! Just got my hair done from a different salon, and I have to say...it doesn't look like yours. I have a question re pricing...Is bleaching included in the price? 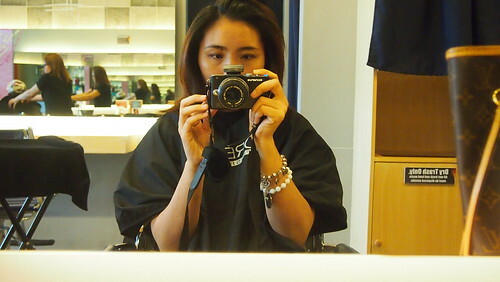 Because I felt like I was robbed in the last salon I went to.